The copyright page is the page that follows your main title page and is where you display the legal part of your book. Be sure to check several books in your category and see what they are using on their copyright page and determine what is best for yours. Also be sure to check with your legal representative for correct use etc. The examples below are for suggestion only. All rights reserved. Except as permitted under ( U.S. Copyright Act of 1976), ) or (Canadian Copyright Act of 2012), no part of this publication may be reproduced, distributed, or transmitted in any form or by any means, or stored in a database or retrieval system, without the prior written permission of the publisher. No part of this publication may be reproduced, stored in a retrieval system or transmitted in any form or by any means, electronic, mechanical, photocopying, recording, scanning, or otherwise excetp as permitted (under Section 107 or 108 of the 1976 United States Copyright Act), without either the prior written permission of the Publisher or authorization through payment of the appropriate per-copy fee to the _______(your company or distributor info) _______, or on the web at _____(your website)_____. Requests to the Publisher for permission should be addressed to the Permissions Department______(your info here)______. The information contained in this book is not intended to serve as a replacement for professional medical advice. Any use of the information in this book is at the reader's discretion. The author and publisher specifically disclaim any and all liability arising directly or indirectly from the use or application of any information contained in this book. A health care professional should be consulted regarding your specific situation. Look on the back cover or open any paper bound book to the second or third page, often referred to as the copyright page, and you will usually find an ISBN (International Standard Book Number). An ISBN is required if you plan to sell paper books or CD's to bookstores, libraries, and many specialty retailers. ISBN numbers are legally yours only if you obtain your block of 10 yourself. If someone else provides you with one number, you must make sure that they also provide you with a statement relinquishing their rights to the number. You would then also have to contact the Library of Congress (or Library and Archives Canada) to have the number ownership transferred. It’s best to get the number yourself. As the publisher, you will have rights to the ISBN that you obtain. Some companies (eg CreateSpace) will provide a single "universal" ISBN for around $100. You would be the registered owner, just as you would if you obtained the block of 10 ISBNs yourself. This might be a good option if you think you will never need more that 2 or three ISBNs. If you intend to sell only e-books and not paper bound books, you may be able to get by without including an ISBN number. However, you may run into resellers who insist that even your e-books have an ISBN. Each format that you publish your book through will require its own ISBN. In other words, the soft cover book will have one ISBN, the hardcover another, the e-book another, and the CD yet another. Do not use the same ISBN assigned to your paper books when marketing your e-books. Otherwise you will end up with some confused and unhappy customers. Technically you not only need ISBNs for your print books, but you need a different ISBN for each format your ebook is being offered in. If you are offering your book as a mobi, epub and a PDF, you need three different ISBNs. In reality, if you are making your eBook available on Amazon Kindle only (mobi), you don’t need any for your Kindle e-book. Amazon is the only place that uses a mobi file… Amazon has their own numbering system…therefore your mobi file does not need a separate ISBN. If you are offering your book as a PDF or epub, you need different ISBN for each. If you correct only typographical errors, and don’t make any substantial changes to the text, you don’t need a new ISBN because it’s considered a reprint. A new edition would contain substantially new material, a major revision, or the addition of completely new elements. Anything that makes it a new book is likely to create a new edition and, therefore, need a new ISBN. If you change only your cover, you can continue to use the same ISBN, since the text has not changed. In the United States, any copyrighted work that is published must be submitted in two copies to the United States Copyright Office at the Library of Congress. This mandatory deposit is not required to possess copyright of unpublished works, but a copyright registration can give an author enhanced remedies in case of a copyright violation. In Canada, the Library and Archives of Canada Act specifies that up to two copies of any published material must be deposited with Library and Archives Canada. Materials deposited in the archives are catalogued; the catalogs are available as part of the Library and Archives Canada website. A Cataloguing in Publication record (aka CIP data) is a bibliographic record for a book that has not yet been published. When the book is published, the publisher includes the CIP data on the copyright page thereby facilitating book processing for libraries and book dealers. The purpose of the Cataloguing in Publication (CIP) program is to serve libraries by cataloguing books in advance of publication. It is not a requirement for your book, but worthwhile if you want libraries to be notified of it's existence. Copyright is the legal protection of your original intellectual property. You cannot copyright ideas or book titles, only content such as books, stories, poetry, music and movies. According to law, your material becomes protected as soon as it is created and available for viewing. A procedure not involving registration and still used by some authors is to send it by registered mail to yourself, and never open the package. If anyone were to try to steal your ideas in the future, the postmarked package of your book would show that you thought of it first. Whenever you ask someone for a testimonial or you wish to quote from another author's words, you will need their signed permission before you can legally publish those words in your ebooks, marketing materials or web site. Otherwise, the person can sue you for infringement. Although registering a copyright for certain types of books may be recommended, legally, copyright exists from the moment your work is created. Registering with the U.S. Copyright Office is necessary, however, if you wish to sue someone for infringement of your material. Cost for registering a copyright is $30 per book. If you wish to register, registration in Canada or the U.S. is fairly straightforward. Visit the Canadian Copyright Office or the U.S. Copyright Office for registration information, forms and fees. The date of publication on your copyright page can be your off-press date, your shipping date, or your publication date. It is your choice what date of publication you put on that copyright form. For legal purposes, the earliest date is probably the best if you want maximum copyright protection. But there is one situation where you would want to have a later copyright date. If your book comes off the press in November, you might still want to set a copyright date for January so your books doesn't look dated in two months. People (reviewers, booksellers, rights buyers) do pay attention to the copyright date in a book. If they receive a book in January 2002 with a 2001 copyright date, the book will appear as if it were already a year old. Not good. Don't set an artificial publication date just for the benefit of Publishers Weekly and other big guns. Set a publication date that actually makes sense for your book. The publication date should be that date when your book should receive its major national publicity, advertising, and distribution in bookstores. If you want publicity in major monthly magazines, you'll have to set a publication date that is at least six months from the time you send them review copies (or, better yet, galley copies). Ideally, bookstores nationwide should get a book about 10 days to two weeks before publication date. Some bigger publishers, of course, have a nationwide laydown date for major books, but smaller publishers shouldn't worry about trying to coordinate such a one-day laydown. The main reason you don't want your book in bookstores too early is that some bookstores return books if they don't sell within six weeks to three months. Setting a national publication date six months out doesn't mean you can't do local author events, sell through local bookstores, or do direct mail campaigns to targeted groups beforehand. In many cases, I would recommend that you do some local events before publication date to help get your author into the swing of things (i.e., get them experience answering media questions and doing bookstore events). While your publication date is, in some sense, fiction, don't think of it that way. Use your publication date as a focal point for all your efforts in giving your book a good launch. Then, after that, ignore the publication date and continue to do promotion for years to come. The books that have become bestsellers for smaller publishers have primarily made the lists because of on-going promotional efforts from their authors and publishers and good word of mouth. And most have done so months or years after the publication date. On the back cover of every book or CD available through bookstores or libraries are barcodes. Although downloadable ebooks will not require a barcode, CD's and printed books will. Barcode labels are electronically scanned at the checkout counters as a way of saving time from punching in numbers. There are several types of barcoding formats. For selling to bookstores, the EAN - Bookland format is used. I will produce a barcode from your ISBN number (and your book price) as part of the book cover production job. The first three digits of the Bookland EAN, 978, are given to every ISBN to uniquely identify the barcode as a book or book related product. 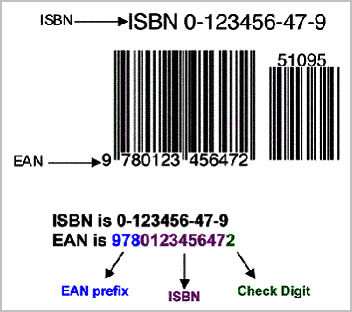 The next nine digits of the EAN consist of the ISBN (minus the check digit). Finally, a new check digit will be calculated for your EAN, which is based on the first 12 digits of the EAN number. The ISBN is printed above the barcode so that it can be manually entered, if needed. Price Code: The five digit add-on encodes the suggested retail price of your book into the barcode. In the United States, the first digit of the add-on is the number 5, which indicates U.S. dollars. A number 6 would indicate Canadian dollars. The remaining 4 digits encode the price without decimals. If the price is greater than $99.99, the add-on should remain as 59999. If there is not a set price, a code of 90000 tells the computer that there is no suggested retail price associated with the EAN code. The price add on bar is not absolutely necessary, but most bookstores prefer to see one.